Google reported a new activation rate milestone: 1 million/day. The rate of activations has been increasing steadily which leads to a question: how high can it go? The answer is easy to determine. It can go no higher than the sales rate of phones and tablets and PCs. So what’s that sales rate? The answer is to take sales (shipments actually) per category and cast the data as “activations”. Defined as “activations” device and computers are being adopted at the rate of about 5.6 million units per day. As a percent of total activations, Android is running at about 15% and iOS is at 10%. 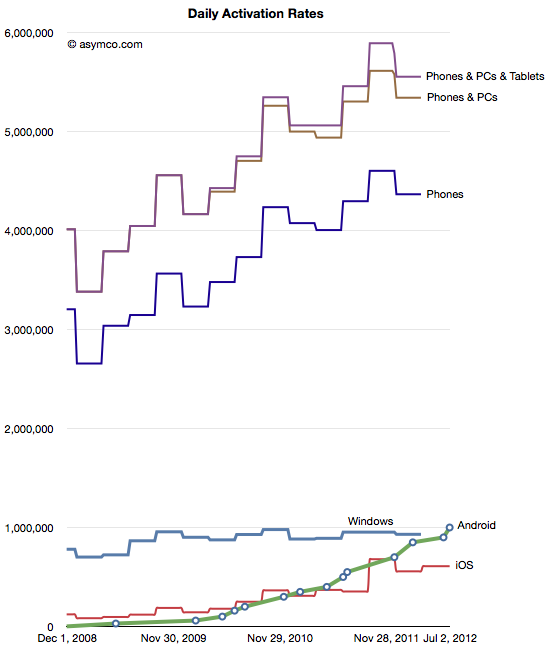 Android has already overtaken Windows activations and with the new iPhone, it’s likely iOS will do as well this year. In terms of available headroom this means that iOS and Android are running at a combined share of 25% of available activations. They both should consider that three quarters of the opportunity is left to go. Will iOS and Android reach a duopoly in terms of activations, topping 5 million per day? Probably not, at least not without some fragmentation or platform diversification (to put it nicely). Nevertheless, 3 to 4 million per day seems an easy target to set.